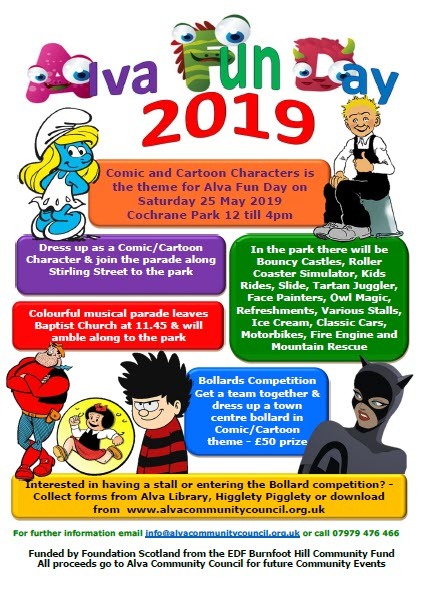 Alva is bracing itself for an invasion of Comic and Cartoon Characters for the town’s Fun Day on Saturday 25 May. Organisers, Alva Community Council are expecting a host of characters to join the colourful musical parade along the main street to the Cochrane Park led by the Classic Cars. This year’s theme offers a chance to escape the real world and be immersed in that time of your life when cartoon tales were real and your dreams were all that mattered. We are hoping that local school children and adults from Alva and the surrounding area will dress up as their favourite Comic or Cartoon Character. Which character best reflects your personality? Dennis the Menace, Minnie the Minx, Smurfs, Popeye, Oor Wullie, Flintstones, Garfield, Bugs Bunny, Daffy Duck? The possibilities are endless! Search the dressing up box and join in the fun! The A91 through Alva Town Centre will be closed for the duration of the town’s third Fun Day Parade which leaves at 11.45 from Brook Street, outside Alva Baptist Church at 1 The Green, Alva, FK12 5JQ. Those taking part should meet there at 11.30am. The parade will amble along the A91 from the Johnstone Arms to the entrance to the Cochrane Park. Police Scotland are assisting with traffic control. In the park there will be Bouncy Castles, Roller Coaster Simulator, Kick Darts, Kids Rides, Slide, Tartan Juggler, Face Painters, Owl Magic, Tombola, Refreshments, Ice Cream, Classic Cars, Motorbikes, Fire Engine, Mountain Rescue and of course various stalls. For further information email info@alvacommunitycouncil.org.uk or call 07979 476 466. Previous Previous post: Polling District and Polling Place Review Check our proposals and let us know your views… Go to the Council website or scan the QR Code and complete our consultation.